Home » serum » Allergies May Prevent Heart Attacks??? Allergies May Prevent Heart Attacks??? Research has been published suggesting an inverse relationship between serum IgE and heart attacks in the US population independent of coronary risk factors. This conclusion was reached based analyzing 4002 participants between 2005-2006. They also detected that of the 7 "data-driven, prespecified allergen clusters," house dust mite was the only allergen cluster for which serum IgE is associated with reduced risk for heart attack. For those wondering, serum IgE is a rough measure of how allergic a patient is generally speaking without any specification of what the patient may be allergic to. It is obtained by bloodwork (RAST or immunoCAP). The higher the IgE levels, the more allergic a patient is generally speaking. However, one must keep in mind that it may still be possible to be allergic even if IgE is low or vice versa. Also, although there appears to be a relationship between IgE and heart attacks, it is doubtful it reaches clinical significance for any given patient. Rather, such conclusions may apply to a general population. This study was also retrospective and as such, it would be nice if a new study now looked at a group of allergic patients and see how many suffer heart attacks in the future. Such un-intuitive relationships just goes to show how complex the human body is where one thing doesn't cause one problem, but rather one thing may affect multiple different aspects of human health. Now why would IgE and/or allergies in general influence heart attack risk? 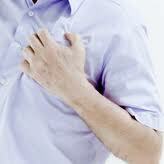 Well heart attacks are due to vascular disease (blockage of the coronary artery). Vascular disease is thought to be influenced by how much inflammation is present in the body. The more inflammation present, the higher the risk of vascular disease which in turn increases heart attack rates. One factor thought to influence the degree of inflammation present in the body is the immune system, and allergies is one part of the immune system. As such, allergies could be a reflection of what the immune system is doing which in turn influences the degree of inflammation present in the body which in turn affects vascular disease which plays a role in heart attacks. Relation between objective measures of atopy and myocardial infarction in the United States. Journal of Allergy and Clinical Immunology. In Press Aug 27, 2012.